ALL UNSOLD ITEMS/LITTER/BROKEN ITEMS MUST BE TAKEN WITH YOU - this is a horses field!! We have had huge issues with people dumping their rubbish. This year we will be taking photos of suspected vehicles. All rubbish that is left has to be cleared as this is a horse field. The tip is just around the corner so go there if you need to get rid of stuff. We will have to put our prices up if this continues because we incur costs for every item left. Sellers found breaking any of the rules below will be asked to leave without a refund. NO COUNTERFEIT OR STOLEN GOODS – This is illegal and unwelcome on our site. NO WEAPONS OR DANGEROUS ITEMS – We will remove them and give to the police. NO LIVE ANIMALS – Under any circumstances at all. NO NEW GOODS – This is a car boot not a market. Some unused goods amongst your second hand items are acceptable but please be advised that we do not want market stalls. ALL GOODS YOU WISH TO SELL MUST BE IN YOUR CAR WHEN YOU DRIVE IN TO THE SELLERS AREA – NO items are allowed to be brought in from the car park on foot. STAY WITH YOUR STALL UNTIL WE LET EARLY BIRD BUYERS IN AT AROUND 7.30AM. THERE IS NO BUYING BEFORE 7.30am. We hold early bird buyers back to give sellers time to set up without being bothered by buyers. This therefore includes anyone who is selling. DO NOT LEAVE ANY RUBBISH OR UNSOLD ITEMS ON SITE – If you need a bin bag for your rubbish please come and ask us for one. All litter/unsold items must be taken with you at the end of the day. This is a horses field not a dump. For any unsold/broken/unwanted items – Charlton Tip is 1/4 mile away so please take any remaining things there. We have your vehicle number plates on record – Anyone found littering our site will receive a fine and be banned from our site. NO FOOD STUFF – Due to health and safety – you are not allowed to sell food or drink. Our catering facility is council inspected. 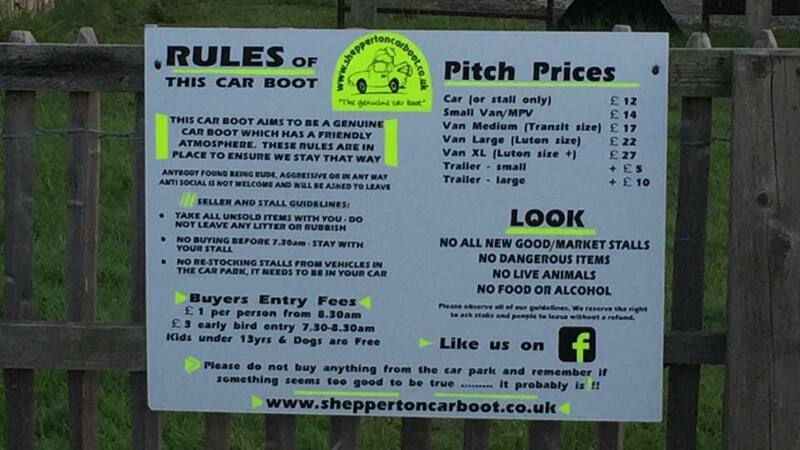 SHEPPERTON CAR BOOT STAFF – can ask sellers to remove any item they are not happy with – If you are asked to remove an item you are selling then please do so immediately. THINGS TO CONSIDER - Your aim? Is it to sell as much as possible quick and cheap? Or to make extra money and take your time? Do you label stuff or wait for offers? .... Expect people to haggle!! Weather watch! As the weekend approaches. Our answerphone will be updated if we have to cancel so call before you leave if you are in any doubt. What time to arrive? You do not need to arrive before 7.00am. We do not allow people in to set up stalls before then so it is pointless . Selling with friends? If you want to park next to a friend who is selling then make sure your cars are behind each other as you go into the sellers area. It is important that the first vehicle tells our staff you want to park next to each other. If you arrive at different times you will need to wait in the buyers car park to join up before entering sellers area in your cars. Take a friend: To help, have fun with, be an extra set of eyes and to watch your stall if you need to leave it. If you do come alone ask a member of our staff to watch your stall if nature calls! Be aware when you are unloading that you can be inundated with interested buyers. Do not be afraid to be firm and make them leave you until you are ready – however this is a time when 2 sets of eyes can certainly be an advantage. Money – Please have your stall fee money ready and seperate from your float. We cannot be expected to wait for you to sell enough items to cover your stall fee - that would be a logistical nightmare!! You pay for your stall early morning - just after you have been parked up so make sure you have kept it separate from your takings. Bring a really decent float including 10 and 5 notes - you will need lots of change too. Bags - Take carrier bags for people to carry sold items and maybe some bin bags if you have large items? Table (pasting tables are often used!) maybe a Clothes Rail/Chairs/Plastic Ground Sheets – All helpful tools when selling. Pack these items last so you can unload on to them when you arrive. We do not hire out tables so bring a ground sheet if nothing else. Holding items – If someone wants to come back later for an item – take the money before you save it for them. If you intend to leave before the end of the car boot tell the buyer what time to be back by. We can not hold items for you. Clothing and essentials – Our field has no shelter so when it is hot you need to be prepared – water, suncream, hat, umbrella for shade? If we have a rain shower then you need to have a plastic cover handy to pop over your items. Children are welcome but they can get bored easily. Maybe having their own area on the table with items to sell will help but make sure you have stuff for them to do and they are well fed, comfortable and able to get out of the sun if they need to. Our car boot can get very busy so do not allow them to wander off – they will get lost. Pets are welcome ONLY if they are friendly and sociable. Any mess must be cleared up by the owner immediately and taken with you. We have a lot of regular canine visitors who we love - so if you dog does not mix well – do not bring it with you. Do not leave animals in locked cars. Car & Security – Do not leave your car doors open all day with interior lights and radios on – Every car boot sees at least one car with a flat battery. Use your car to safely lock away/hide handbags or takings.